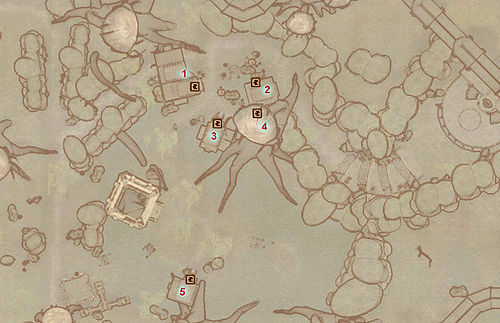 Passwall is a village located inside The Fringe, just west of the Gates of Madness (quest-related). The center of town consists of two houses and an inn, The Wastrel's Purse, offering food and accommodation. A latecomer, Jayred Ice-Veins, built up a house to the southeast of town, near the lake. 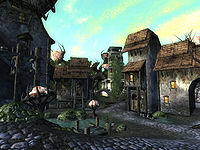 The village is surrounded by architectural evidence of an earlier and much larger civilization, which is also hinted at by Dredhwen in her dialogue. Shelden is the self-proclaimed mayor, since he was the first citizen to arrive. All of the inhabitants are hopefuls waiting for "Sheogorath's blessing" in order to pass the Gates of Madness, located just up the hill, and enter the Isles proper. Once you manage to defeat the Gatekeeper, however, only Jayred will take the big step and leave the Fringe. During the Retaking The Fringe quest, Passwall is overrun by the forces of Order and is therefore transformed into a barren, grey landscape bristling with obelisks. The town itself is the epicenter of the battle between Lord Sheogorath's troops and the Knights of Order. After the Main Quest is complete, it is possible for Passwall to be completely deserted or have just one person left. Jayred Ice-Veins leaves after you kill the Gatekeeper, Relmyna and Nanette relocate to Xaselm, Felas dies, Dredhwen stays in the "ordered" version of the town, and Shelden can either die during the Knights of Order attack or be saved by the player. Despite being isolated from the rest of isles, the people of Passwall seem well-informed of what's happening in the rest of the realm. Passwall shares its name with an infamous spell that appears in Arena, but there is no evidence to suggest the town is named after the spell or vice-versa. This page was last modified on 3 April 2017, at 20:35.